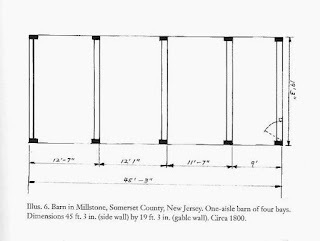 In Dutch Barns in the New World* Gregory Huber includes 4 measured floor plans (p. xxviii and xxxi). He describes some of these barns as hybrids, barns where the central aisle was not used for threshing and the doors were on on the long side, not under the gable. 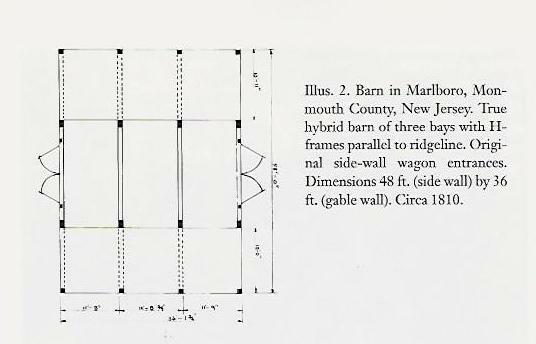 I started with Gregory Huber's drawing and description of a hybrid barn floor plan in Marlboro, Monmouth County, NJ, c. 1810 - Illus. 2, p. xxviii. 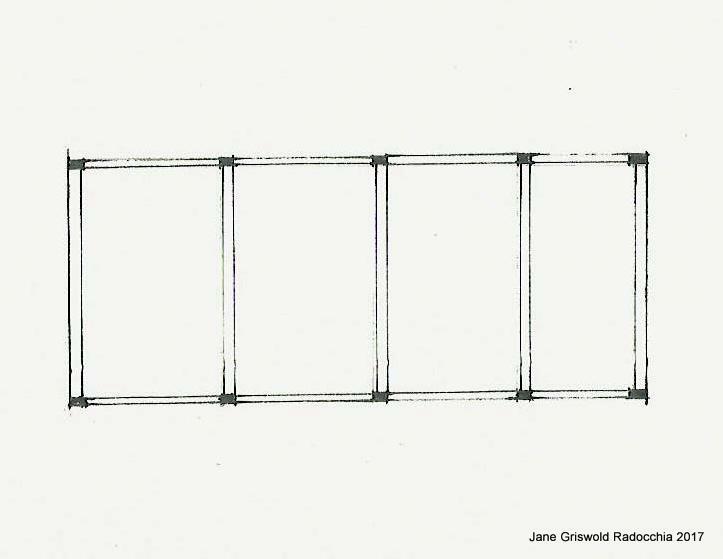 The carpenter who laid out this frame seems to have begun with not only the layout in mind but the size: 36 ft x 48 ft. He would have had a 10 ft rule marked in feet and inches and a folding compass to use to step off 36 ft and 48 ft. 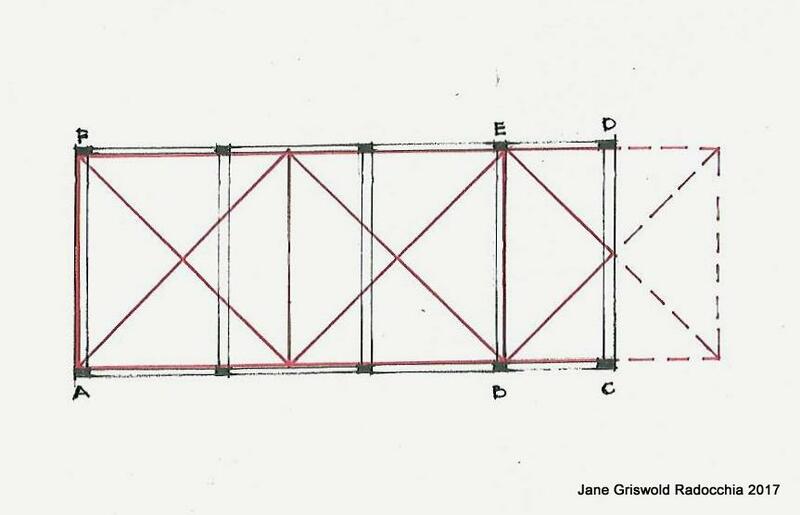 He would then have squared the rectangle with twine across the diagonals - just as carpenter do today. A post went in each corner - easy to do. 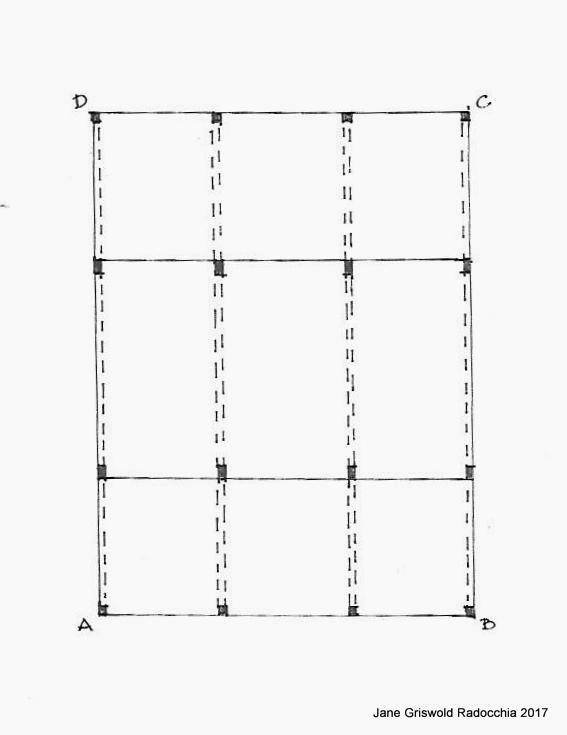 I have redrawn Huber's Illustration to scale and labeled the corners A,B,C,D. Remember to click the drawings to enlarge them. I think the builder then laid out a square, with the sides the distance between his posts on one end of the barn. 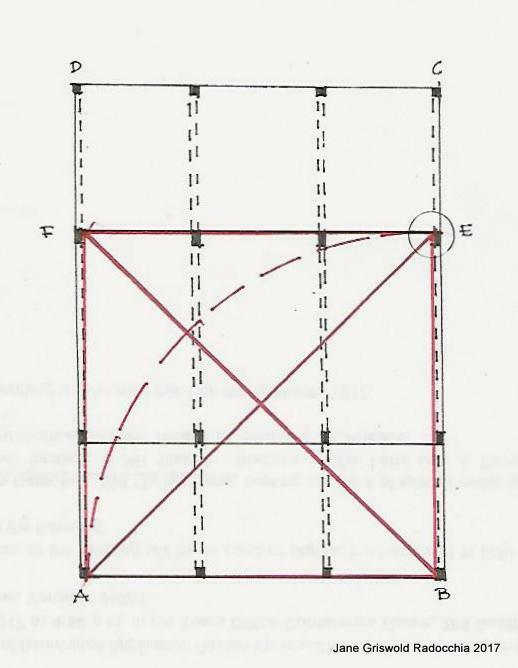 Here I have shown the arc of barn width, A-B determining the length of the side B-E The builder would have know how to lay out a square and would have trued his square with diagonals - the square, the arc and the diagonals are shown here in red. 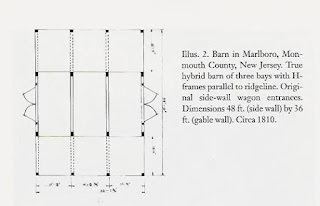 The line E-F determines the location of one side of the barn's nave; in the drawing it is the 'upper side'. 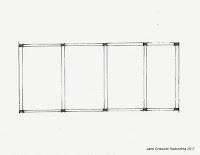 Modern construction drawings usually dimension to the center of an opening or a post. I often find that master builders who used practical geometry ran a line beside the posts, so it could be there for the framers. 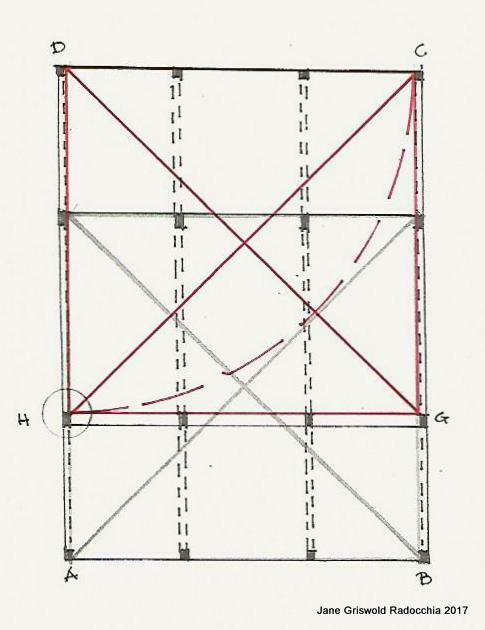 This makes sense when one is building using drawings made on boards or plaster with one end of a compass, or a 'pricker', or with charcoal or chalk on a framing floor. The master builder seems to then have laid out a second square starting from the opposite end of the barn, from C-D. The square is C-D-H-G. The 'lower' side of the nave is H-G. He sets his posts on the same side of his line each time - in the drawing 'below the line', closer to A-C . This makes the 2 side aisles different widths. Perhaps this was on purpose. Now the only placing left to determine is the interior posts. The Rule of Thirds easily divides the squares into 3 equal rectangles. Where the lines cross is the inside face of the posts and the beams above. 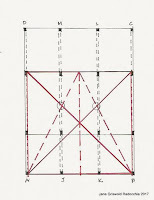 The Rule of Thirds was used by Palladio and Serlio. It is not specific to the traditional framing techniques of English carpenters, although it is very often used, with 'crossed squares' as is seen in this barn. The second barn I looked at was in Millstone, Somerset County, NJ. c. 1800, shown in Gregory Huber's Illus. 6, p. xxxi. These one aisle barns he says were accessory, or the next barn built on a farm, not the first one. Here is my drawing based on the dimensions in that illustration. As with Illus. 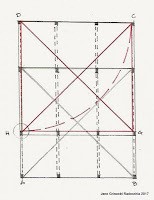 2, the master framer laid out the frame from the insides of the corner posts. He probably started from the left end: A-F. The patterns of the squares do not layout smoothly if reversed; it can be done, but not easily. I always look for the simplest, easiest way to lay out a frame, knowing that the framer had many more important things to do than play with geometric patterns. 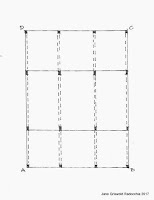 The layout is straightforward - 2 squares ( A-B-E-F) and a half (B-C-D-E). B-E locates the interior posts and beam on the right end. In this case I think the framer used 9 ft as his beginning length. 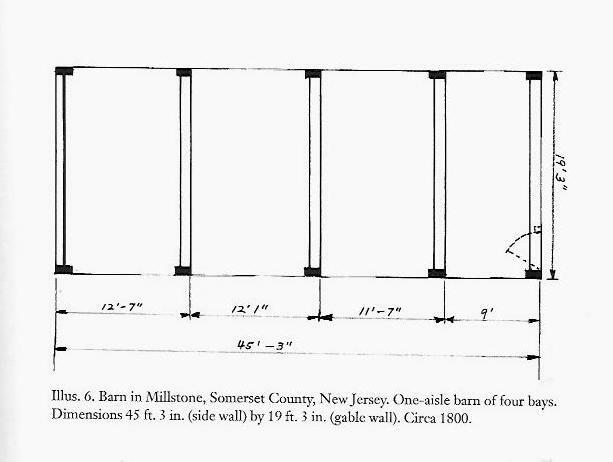 thus the barn width inside to inside would have been 18 ft. 8"x 12" posts would have made the width of the barn 19'- 4". Huber's measurement is 9'-3". Either the posts were not quite 8" wide, or the 9 ft. length was not quite 'true'. There was no need for it to be true as long as the framer used that dimension consistently. He was using practical geometry. 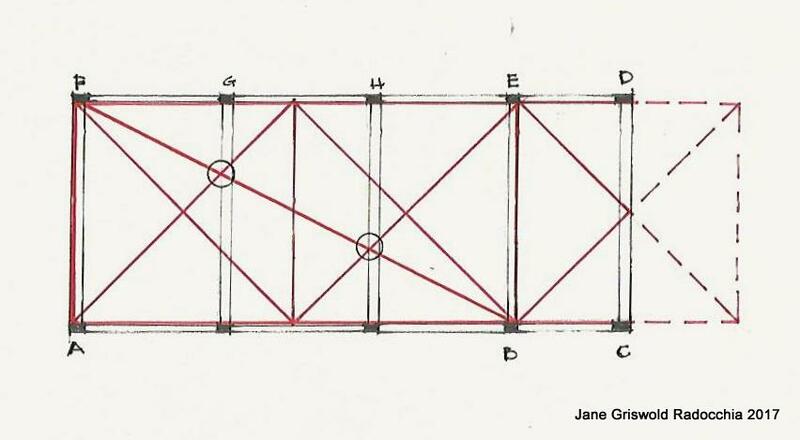 The drawing - its 2 red squares with their diagonals - makes the 2 middle post and beam locations clear: the double square was divided into 3 equal bays. Using practical geometry, I drew a diagonal across the rectangle from D to B. 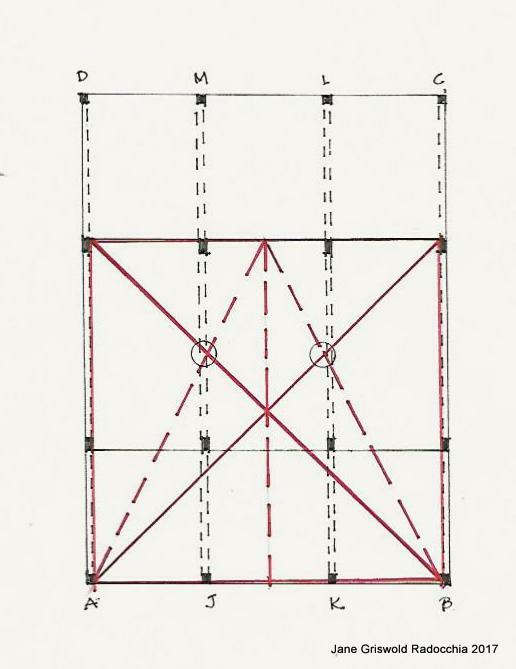 It intersects the diagonals of the squares at the interior beams (G and H) determining their locations. 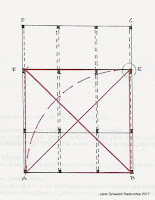 The diagonal from A to E would also cross and intersect the diagonals of the two squares at the intermediate beams. 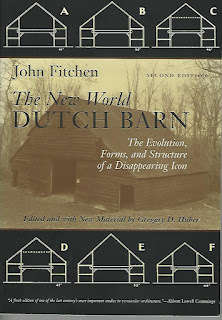 * The New World Dutch Barn, 2nd edition, by John Fitchen, edited and with new material by Gregory D. Huber, Syracuse U. Press, 2001. 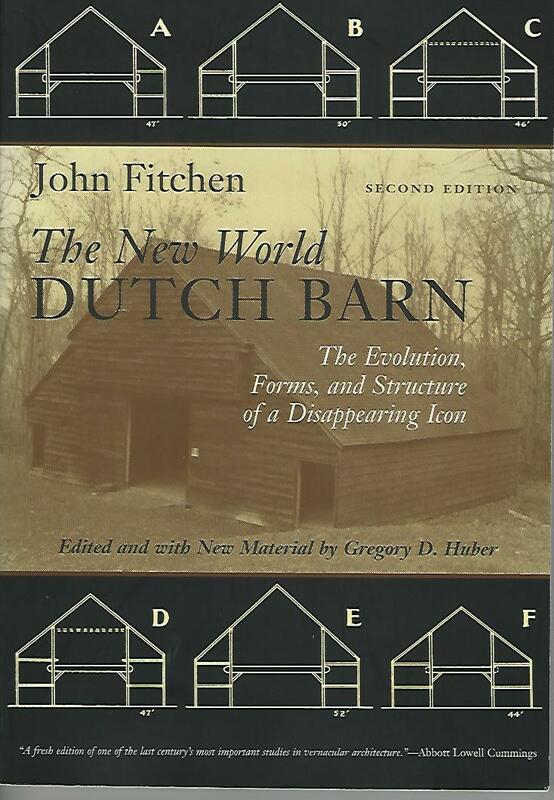 If you are curious about Dutch type barns built in the New World (the Colonies) or the antecedents to barns built by settlers in the Appalachian Mountains or the Midwest before 1860, I highly recommend this book. I have deleted what was a personal conversation. I expect my visitor and I will continue our discussion in a another place. I am happy to talk with him, but sometimes social media is not the right venue.